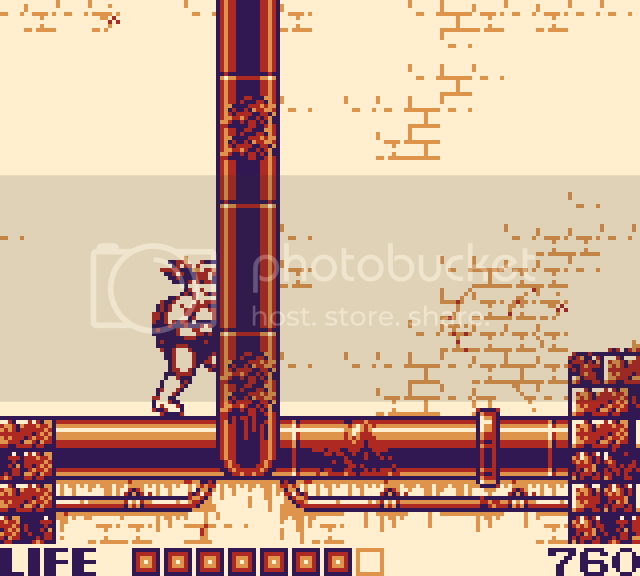 As with Rocket Man (http://gbdev.gg8.se/forums/viewtopic.php?id=250) I would like to record in the forum the progress of a new parallel project that I started recently for Game Boy. We are the same team, with Seiyouh (https://twitter.com/seiyouh) in charge of the graphic part, NAP.VGM (https://twitter.com/NAP_VGM) making music and sound effects and I (https://twitter.com/Imanolea) as responsible for the design and programming. This is Last Crown Warriors, a game that aims to bring to the Game Boy the action of the Musou or Warriors games. The first playable prototype is now in process, development can be followed either through the twitter hashtag #LastCrownWarriors (https://twitter.com/hashtag/LastCrownWarriors?src=hash) or through the updates I will be posting on Imanolea's Games (https://imanoleasgames.blogspot.com.es/ … 20Warriors). I will try to inform through this forum as well. In the last update I focused on getting a multi-directional scroll that supports high speeds. Regards, I hope you like the game. Teaching Game Boy development trough videos is something that's been on my mind lately. But right now, I prefer to prioritize the development of the projects I'm currently working on. In any case, fortunately there are already many good tutorials to get started in Game Boy development. Something that I hope that you'll show in a video tutorial is bank switching. Thank you for the interest shown. I prefer to limit the discussion of this topic to the game that is showing, Last Crown Warriors. I'd rather talk about specific Game Boy development issues on a dedicated topic. I have seen that example before @tag365, still trying to wrap my head around it all. It is pretty confusing, but I believe I am beginning to understand it. I'm sorry if it seems that I'm ignoring you, I thought I already answered your question. About your specific problem, there is already a topic dedicated to the engine about which you have doubts (http://gbdev.gg8.se/forums/viewtopic.php?id=381). I think it would be better to ask there in order not to distort this topic. Maybe you need to put some work in yourself. Also, have more patience. because lately i'm thinking about the subject in gb (or gbc), i noticed that when your sprite gets to high grass then its tiles are changed so it would feel like the grass is in front of it. it looks good, but i wanted to know if you had any other ideas for technics for creating the feeling of hiding (with grass, walls, trees and so on). or any interesting Thoughts based on the technic you used here. Showing some graphics behind others in Game Boy is not especially simple. What I do in Last Crown Warriors is the same thing that is done in the Zelda saga for this platform, put sprites of grass over the sprite of the character. The point is that the hardware first draws the sprite with the lowest X coordinate, and in the case that two sprites share the coordinate, it first draws the sprite that is in the highest memory address. The grass sprite shares X coordinate with the character, but is located in a lower direction, so it is drawn above. So in a system like Game Boy it is difficult to control which sprite is going to overlap another, unless the coordinates are controlled. The truth is that there are other techniques to achieve this effect. For each sprite there is a priority bit, with which we can get our sprite drawn behind the background. So with a white background (color 0), and the priority bit of our sprite raised, we can get it to be drawn behind any element in the background. This happens in "Teenage Mutant Hero Turtles - Fall of the Foot Clan". Beyond these options, there are sure to be others. The important thing is to try to take full advantage of the limitations of the system. Sprite priority is a handy thing to keep in mind in general, particularly if you're planning on having many on screen at once! Infinitron keeps certain sprites in higher priority places as they're more important to the player so it's not so bad if 8 or more share the same scanline. I'm loving seing how this game is coming along btw, best of luck with it's future development! I agree that it is a good idea to place bullets or important objects for the player in lower memory addresses. Although one of the biggest problems comes when you exceed the limit of 10 sprites per line, there the memory address of the sprite apparently loses its importance and from what I understand the sprites with a higher value in its X coordinate are the ones that are not drawn. I see that in Infinitron you use also many simultaneous sprites, I do not know if you have had to face this limitation. In any case, good luck with your projects too. Yeah, somehow it's not become a big issue despite the number of sprites on screen at once. When I was testing it out with more enemies on screen the x-co-ord definately became a factor regarding drawing priority. But yeah, luckily, no real need for flickering. GBDK would probably eat up too much CPU doing more comparisons for flickering I reckon. Today I posted a new game screenshotsaturday. This covers a first approach to attacks in the game. I look forward to commenting on the game features in-depth with a dedicated blog entry. Do you plan on having multiple characters available in the game? If yes, I guess they would have different gameplay mechanics? For the first version of the game, three different playable characters are in development. Each will fight with a different weapon and will have an exclusive secondary weapon that will affect their gameplay. For now two have been shown: The legendary soldier of Last Crown, a game I made for the BitBit Jam 2015 (https://imanoleasgames.blogspot.com.es/ … -2015.html). And Lilian, a forest warrior. For future versions, some additional characters are planned. I wrote a post in the blog explaining how the scroll system of the game works. Any kind of feedback is appreciated. Thanks, the blog entry is very instructive. It would be very interesting if you could publish similar posts on other topics that are required for game design (like efficient routines for collision detection etc.). In future posts I will try to cover other aspects of the development. In the specific case of the scroll system, I think it could be said that it is "finished". As I leave "finished" systems, I will try to write about them. Always from a conceptual point of view, so that it is not necessary to understand assembly in order to apply the ideas that are exposed. The collision will surely be one of the systems on which I will write.